He might seem like just a regular guy, but don't let that fool you. Beneath the affable exterior he's tough as nails, smart as a whip, and ready for whatever crime wants to dish out! 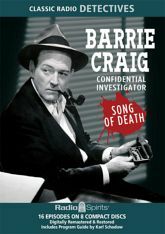 He's Barrie Craig, Confidential Investigator -- and he's on the track of sixteen red-hot cases in this exciting eight-hour collection starring William Gargan! Cases cross the threshold of his Madison Avenue office, and he's got a crack team of supporting cast members to back him up -- including Jackson Beck, Parker Fennelly, Joan Alexander, Mandel Kramer, Elspeth Eric, Santos Ortega, and more.